Cheerful mixed race son writing educational tasks on note pad while caring father busy with household chores at home. Loving dad giving assignment to his boy while family relaxing together in evening. 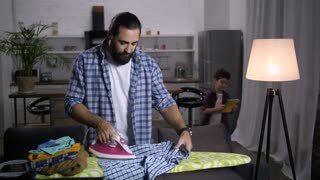 Caring bearded single father busy with household chores helping his mixed race son with homework in domestic room. Loving dad assisting schoolboy with studying whilst ironing clothes at home. A close-up of loving and caring senior man talking to his disabled wife at home. A senior couple at the table at home, a man helping his disabled wife. Slow motion.